This is Max Forstat; she owns a building which has 4 apartments per floor. There are 6 floors in the building. She decides to number the apartments from 1 to 24, starting from the ground floor. Apartments 1 through 4 are on the first floor, 5 - 8 on the second, and so on. How would you figure out which floor each apartment is located? 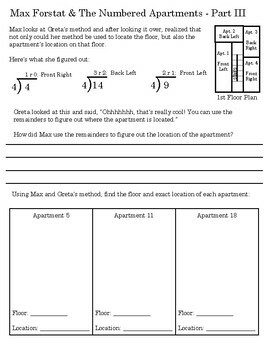 This activity gets students involved in performing division with and without remainders, and then using the remainder to determine the floor and location of the apartment. Our main characters are sisters Max and Greta Forstat, who own apartment buildings. 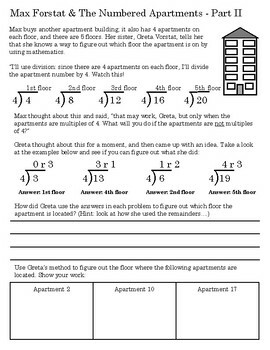 By dividing the apartment number by the number of apartments per floor, students practice basic division facts, write out the remainder, and then interpret that remainder. What makes this activity awesome AF? 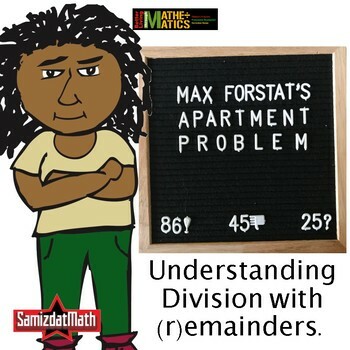 Because it gets children to do division in an interesting and provocative context, and because almost all of the problems have remainders (because in real life, 99.9% of all division problems do have remainders....) How many times have you heard students say "wait, 4 doesn't go into 18!" Well, 4 does "go into" 18, it just doesn't go in evenly. Well, yeah! 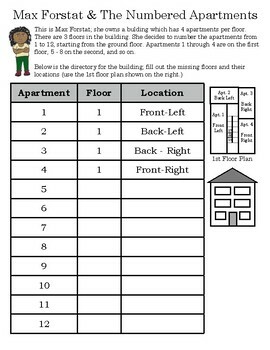 The activity is carefully paced, has an additional challenge problem, and also a "do it yourself" sheet where students can make their own apartment house problems. There is also a complete set of instructions for teaching your students about the importance of remainders, and a detailed answer sheet.